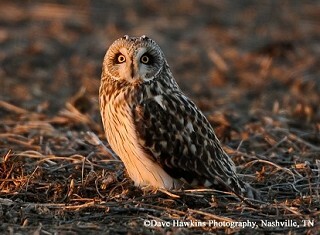 The ear-tufts of the Short-eared Owl are rarely seen and so do not represent a good field mark. This owl is rare in Tennessee and only occurs in the state during the non-breeding season. It is most likely to be seen at dawn or dusk hunting low over open ground, locating prey by ear. The Short-eared Owl is one of the most widely distributed owls in the world, breeding throughout much of North America, Eurasia, South America, and even on islands including Iceland, the Hawaiian chain, and in the Galápagos! In winter the northern-most North American birds retreat to southern Canada and southward into Mexico. Description: This medium-sized owl has a large, round head, with a dark patch around the yellow eyes. The back is mottled brown, and the chest is pale with thin streaks. In flight, the wings are long and narrow, with a large buffy patch on the outer end. They fly close to the ground with an easy, floating flight. Voice: The song is an emphatic wheezy bark. Barn Owl is paler and has a white heart-shaped face, a pale tawny brown back, and a mostly white chest. Long-eared Owls, rare in Tennessee, look similar in flight, but are darker, with prominent ear tufts, and barring on the belly. Habitat: In Tennessee, found in open areas, especially brushy fields. Diet: Small mammals and sometimes birds. 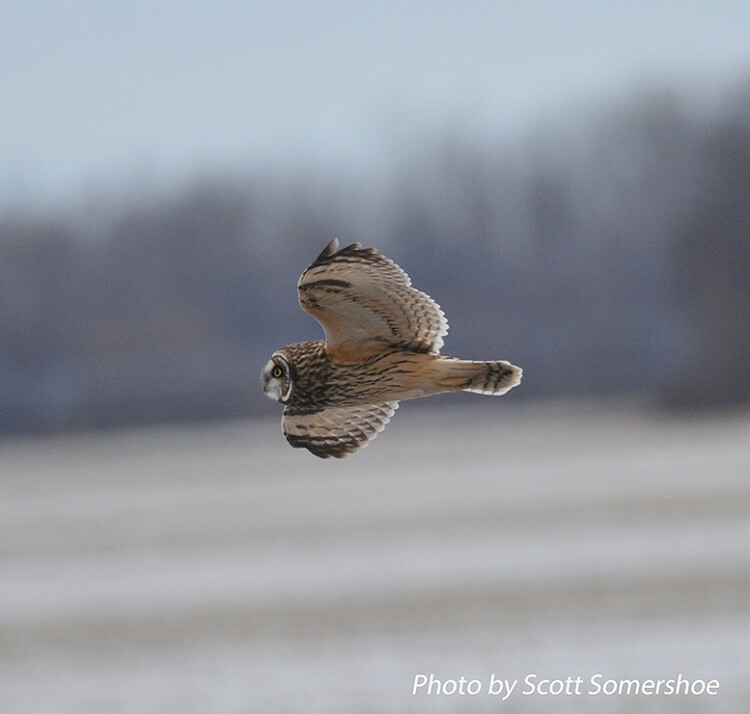 Status in Tennessee: The Short-eared Owl is a rare, but regular migrant and winter resident primarily in West and Middle Tennessee. Numbers vary from year to year. They arrive in the state by late November and depart by mid-March. During the breeding season, this owl hunts both day and night. During the winter, it mainly hunts at dawn and dusk. When hunting, they fly low over open ground, locating small mammals by ear. Short-eared Owls roost communally on the ground during the day. 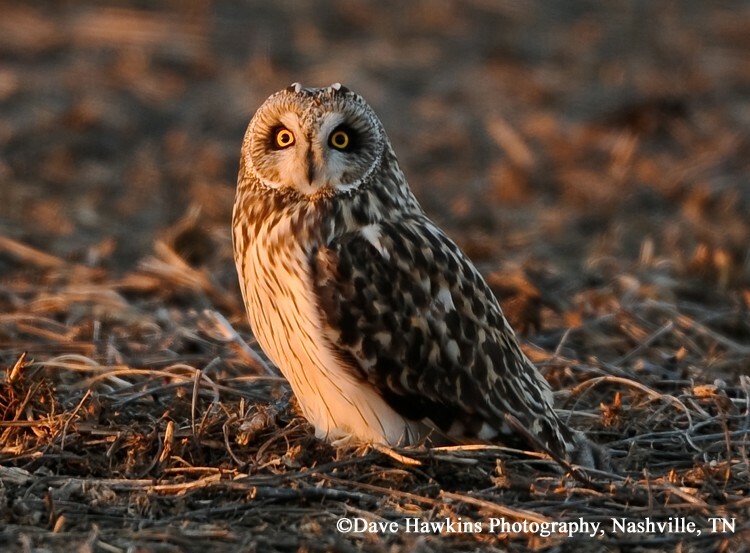 Best places to see in Tennessee: The most regular place to see Short-eared Owls is over brushy, or agricultural fields in the Reelfoot area and elsewhere near the Mississippi River. Wiggins, D. A., D. W. Holt and S. M. Leasure. 2006. Short-eared Owl (Asio flammeus), The Birds of North America, No. 62 (A. Poole and F. Gill, eds.). The Academy of Natural Sciences, Philadelphia, PA, and The American Ornithologists' Union, Washington, D.C.